The Fast Lane JLX MicroDrive car is a relatively recent entry into the "car that can drive upside-down" market. With its oversized tires, it doesn't much care which side its on; as long as it's on the ground, it should go. Also because of the large tires, it should be able to drive on pretty rough surfaces for its size, though there are no guarantees and I'll be crossing my fingers when it's testing time. The set doesn't come with batteries, and it'll need 6 AAAs to get started. As always, I do recommend using rechargeables for the vehicle itself. Batteries often come in multiples of 4, especially rechargeables, and thankfully the JLX MicroDrive uses exactly that number. Alright, let's take a closer look at this thing and see whether it's a good value, or just plain cheap. Refreshing! The Fast Lane RC JLX MicroDrive outperformed most mini-sized vehicles I've ever tested, and it even did better than a lot of much larger & more expensive cars. 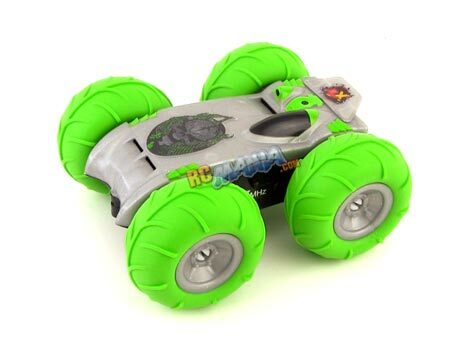 This is truly a fun, exciting little RC to mess around with, delivering one of the most purely positive driving experiences available for a wide age range thanks to its stubborn refusal to get stumped by such mundane obstacles as thick carpet, gravel, soft dirt, walls, and crazy drivers. I think the only thing that could really make this car better would be the inclusion of batteries, but as it is, I think it's already a great deal.